It’s not often that you hear of a modern American city taking on a ceremonial costume based on 19th century folk dress! Lindsborg in Kanas was settled in1869 by a group of Swedish immigrants from the Värmland province of Sweden led by Pastor Olof Olsson and today thirty percent of the population is of Swedish heritage. Now a new costume, the Svensk Folkdräkt, has been designed by Tara Killingsworth and Carla Wilson to mark the community’s 150th anniversary and celebrate the city’s Swedish-American heritage. The pair worked together bringing Killingsworth’s knowledge of fabrics and fashion together with Wilson’s familiarity with Swedish history, as well as her extensive collection of traditional dress patterns. ″[Killingsworth] approached me last November and said ‘I want to design a Lindsborg Swedish costume, will you co-design it with me?’” Wilson told McPherson Sentinel. The pair researched rural clothing, both Swedish and American, from 1867-1900. “Right away, we both really wanted the costumes to represent both our Swedish and American heritage,” Wilson said. The women’s outfit includes a high-collared white blouse and green ankle-length skirt. A yellow linen vest is trimmed in blue and a white apron is worn on top with a floral design. The men’s costume consists of olive green trousers and a white shirt worn underneath a red vest. Both outfits include a red patterned neck rag that was an important practical feature of many peasant styles of dress. In the 1800s, neck rags were often made of silk and could be used to filter drinking water or be used as a sling or tourniquet for injuries. Meanwhile the blue hem on the skirt can be replaced if it gets too dirty or worn out. Women, girls and boys also wear white stockings. “We asked people what reminded them of the Smoky Valley,” Killingsworth said. “That yellow, red and green, those were all colors that people threw out there. 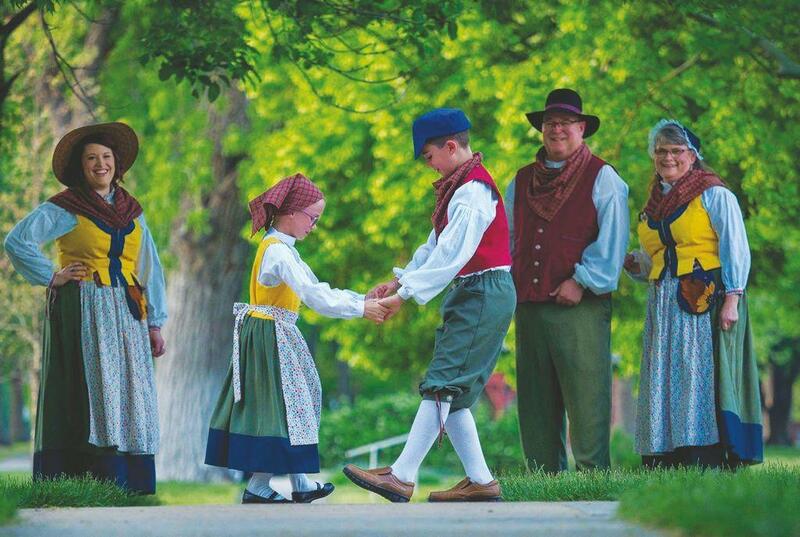 The costume’s colors, cuts, fabrics — even the hats and buttons — tell a vivid story at a glance of our history and culture, both Swedish and American,” said Lindsborg Mayor Becky Anderson in proclaiming Lindsborg’s Svensk Folkdräkt on May 7, 2018. The colours are what really defined the costume as a modern reinvention. “We’re actually encouraging groups to make slight changes,” Wilson said. ”…I think that makes the costumes fun to wear.” Part of the idea behind the costume is that traditional dress can still be worn by anyone who wishes it while Lindborg’s newer residents, including Wilson and Killingsworth, can feel truly part of the rich culture by wearing the new design. Killingsworth and Wilson want to offer printed patterns for Lindsborg’s Svensk Folkdräkt in time for the anniversary in 2019 so that people can make their own folk costumes. The complete process of printing the patterns and instructions is estimated at $20,000 while the proceeds from sale will fund development of accompanying period coats. Men and women in folk costumes from Järrestad, Skåne 1873. Nordic Museum. Bond girl and peasant woman from Harjager County, Skåne. Nordic Museum.